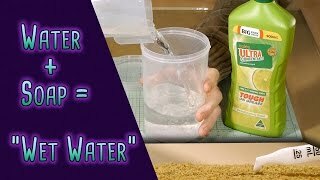 In this back to basics guide I will describe and demonstrate how to make and use “wet water”. Don’t forget to check out where I post other tutorials ond information related to model railroading. Wet water is used to presoak your scenery prior to applying the glue, it allows the glue to penetrate the scenery providing a strong reliable bond. A good starting point is to mix a ratio of 1 part soap to 100 parts water, basically 1% and then test it on a small area, you may find you need slightly more or less soap depending on the type of soap you use. Whether your applying ground foam, dirt or ballast for your model railroad or terrain, you’ll most likely need to pre wet the area with wet water.